Image courtesy of the Ocean Township Police Department. Nearly 10,000 power utility companies are without power late this morning throughout the Jersey Shore due to this morning’s winter storm. The heavy, wet snow is responsible for taking down trees and power lines throughout the northern Shore area. 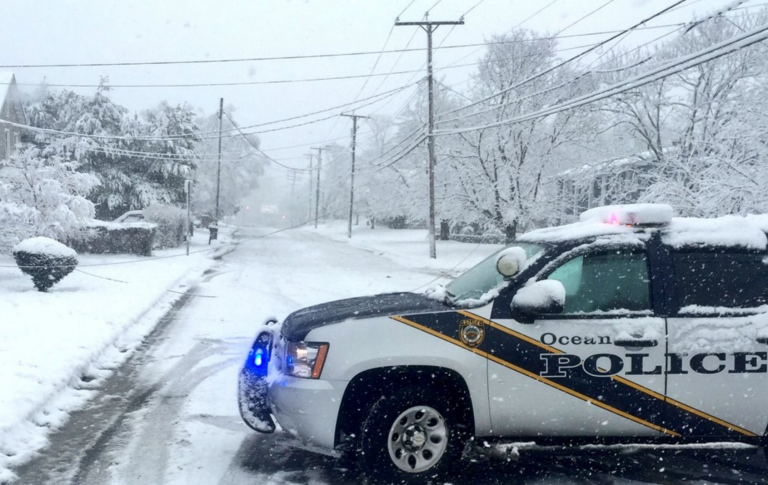 The snow took down a tree in Freehold, and a power line fell in Ocean. A transformer reportedly malfunctioned near the beach in Long Branch. Up to seven inches of snow fell at the Jersey Shore. Nearly 8,000 JCP&L customers in Monmouth County are in the dark, while about 1,400 customers are without power in Ocean County as of 11:15 a.m. The utility expects full restoration by 6:30 p.m. today. Further south in Atlantic City Electric’s coverage area, which includes portion of southern Ocean County and the remainder of the southern Shore, approximately 500 customers are without power as of 11:15 a.m.